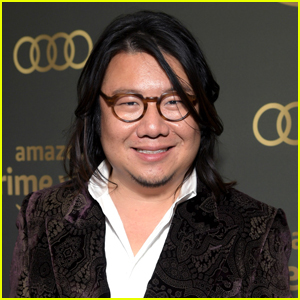 'Crazy Rich Asians' Author Kevin Kwan Gets Comedy Pilot Order at CBS! Kevin Kwan is working on a new show! The Crazy Rich Asians author and David Sangalli are writing the pilot for the new comedy The Emperor of Malibu, which was just ordered by CBS. The show will follow the son of a Chinese billionaire who gets engaged to an American woman. When his family finds out about the engagement, they try to win their son back and test-drive the American dream. Kevin and David are also working on an Amazon drama centered around a Hong Kong family and their influential business empire. Here’s to hoping the shows get picked up! 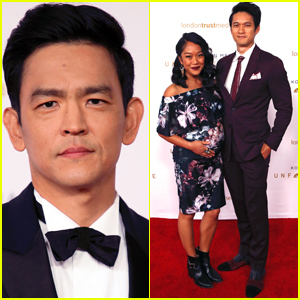 Henry Golding, Michelle Yeoh, & 'Crazy Rich Asians' Cast Dress to Impress at SAG Awards 2019! Henry Golding, Michelle Yeoh, Ken Jeong, and Constance Wu appear on stage at the 2019 Screen Actors Guild Awards held at the Shrine Auditorium on Sunday (January 27) in Los Angeles. The four actors presented a clip from their movie Crazy Rich Asians, which is nominated for Outstanding Performance by a Cast in a Motion Picture. Other cast members who are in attendance included Gemma Chan, Awkwafina, Harry Shum Jr. (with pregnant wife Shelby Rabara), Lisa Lu, Ken Jeong (with wife Tran), Ronny Chieng, and Fiona Xie, as well as director Jon M. Chu. FYI: Constance is wearing a Oscar de la Renta dress, Stuart Weitzman shoes, and Harry Winston jewelry while carrying a Amanda Pearl clutch. Awkwafina is wearing a Mimi Plange dress, Le Vian rings, Narcisa Pheres earring, and Christian Louboutin heels while carrying a Tyler Ellis clutch. Gemma is wearing custom Oscar de la Renta with Christian Louboutin shoes and Harry Winston jewels. Henry is wearing Tom Ford. Michelle is wearing an Elie Saab gown and carrying a Roger Vivier clutch. Harry is wearing an Armani tuxedo, Christian Louboutin shoes, an Anto shirt, a Chopard watch, and David Yurman cufflinks and ring. Ken is wearing a J Crew suit and shirt, and an Armani bow tie. Fiona is wearing a Schiaparelli Haute Couture dress and a Hearts On Fire ring. 'Crazy Rich Asians' Wins Best Comedy at Critics' Choice Awards 2019! 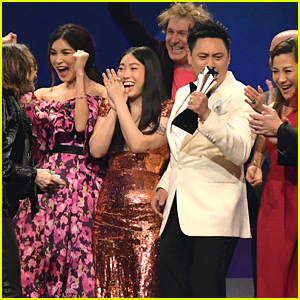 The cast of Crazy Rich Asians appears on stage to accept the award for Best Comedy at the 2019 Critics’ Choice Awards on Sunday (January 13) at the Barker Hangar in Santa Monica, Calif. The film beat out Deadpool 2, The Death of Stalin, The Favourite, Game Night, and Sorry to Bother You to win the award. Stepping out for the event were Constance Wu, Gemma Chan, Awkwafina, Nico Santos (also a nominee for his work on Superstore), Ken Jeong, Harry Shum Jr., and director Jon M. Chu. Producer Nina Jacobson accepted the award. Though it did not win the awards, the movie was also nominated for Best Acting Ensemble, Best Actress in a Comedy for Constance, and Best Production Design. FYI: Constance is wearing Rodarte with Aquazzura shoes, Lorraine Schwartz jewelry, and a Roger Vivier clutch. Gemma is wearing bespoke Jason Wu with Jimmy Choo shoes, Anita Ko jewelry, and a Tyler Ellis bag. Awkwafina is wearing an Elisabetta Franchi dress, Christian Louboutin shoes and clutch, Stefere earrings, and a State Property ring. Jon is wearing Tom Ford. Nico is wearing Paul Smith. Harry is wearing a full Roberto Cavalli look, Johnston and Murphy shoes, and a Montblanc watch. 'Crazy Rich Asians' Stars Attend NBR Awards to Accept Best Ensemble Prize! The stars of Crazy Rich Asians walk the carpet at the 2019 National Board of Review Awards Gala on Tuesday (January 8) at Cipriani in New York City. Constance Wu, Gemma Chan, Michelle Yeoh, and Awkwafina were all in attendance to accept the award for Best Ensemble. The movie was nominated for Best Motion Picture – Musical or Comedy at the Golden Globes over the weekend. FYI: Constance is wearing a Galvan dress, an Amanda Pearl clutch, and Anabela Chan earrings. Gemma is wearing an Erdem dress and Christian Louboutin shoes. Awkwafina is wearing an Elie Saab dress, Aldo shoes, and Hueb earrings. Michelle Yeoh Wears 'Crazy Rich Asians' Emerald Ring to Golden Globes 2019! Michelle Yeoh brings her Crazy Rich Asians character to the 2019 Golden Globes! The 56-year-old actress wore her character’s iconic emerald ring on the red carpet as she arrived at the awards show on Sunday (January 6) at the Beverly Hilton Hotel in Beverly Hills, Calif. Joining Michelle on the red carpet was the author of the Crazy Rich Asians book Kevin Kwan.